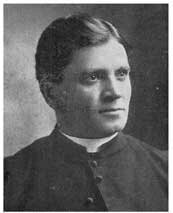 Father Florian Chodniewicz was born on May 24, 1861 in Wachock, Poland. He completed his primary education in Wachock, and continued at the Kielce Gymnasium (a preperatory academy). He studied Philosophy at the Sandomierz Seminary. He first studied Theology in Krakow, where he was a student at the Jagiellonian University for two years. Fr. Chodniewicz came to the United States and attended the Polish Seminary located in Detroit, Michigan. After some time the Bishop of the Detroit diocese, His Eminence Father John S. Foley sent him for further theological studies at the Baltimore, Maryland Seminary. Father Chodniewicz received his priestly orders on August 19, 1889 in Detroit, Michigan from the hands of Bishop John S. Foley. He spent the first three years as an assistant at St. Wojciech parish in Detroit, Michigan, where he became the pastor. During his six years of service in Detroit, Father Chodniewicz built a six story school building, which was later converted into a factory. After six years in Detroit, he was transferred to the Chicago Archdiocese where he was first assigned to a parish in Downer’s Grove. From there he was transferred to Chicago’s St. Joseph’s parish. Archbishop Patrick Augustine Feehan transferred Fr. Chodniewicz to St. Columba parish in Hegewisch. He was given the task to establish a parish for the growing Polish Community. After the completion of the Church, Father Florian started construction on a 400 student parish school. Construction of the school was completed in 1908. After the school was completed construction began on the Rectory; which was completed in 1911. Fr. Chodniewicz also performed duties as a diocesan consultant. Despite being pastor of St. Florian, Fr. Chodniewicz also celebrated Mass at St. Columba. He was a patriot and always defended Polish ideals. He also worked diligently to establish the Association of Polish Priests in America.